Officers of the law beat or harass various congregations. HYDERABAD, India, October 28, 2018 (Morning Star News) – Police officers rushed into a praise service at a house in Tamil Nadu state and began hitting worshippers in another violent month for Christians, sources said. A female police inspector identified only as Jeyalakshmi and five police officers on Oct. 6 entered the house where Christians were spending the evening in praise and worship in Aralvaimozhi, Kanyakumari District, the pastor said. Jeyalakshmi held Pastor Yesudas by the neck and struck him in his stomach and back, he said. Pastor Satyaseelan, who goes by a single name, told Morning Star News he hurried over to Aralvaimozhi from Anjugramam in 10 minutes after receiving a call from Pastor Yesudas. Satyaseelan and other Christians submitted a petition to the district’s superintendent of police and the district collector with the help of senior pastors, but no action has been taken against Jeyalakshmi and her subordinates, he said. Police officials in Kanyakumari are under the control of a Bharatiya Janata Party (BJP) leader elected as the member of Parliament from the district, said a local source who requested anonymity. “Inspector Jeyalakshmi is close associate to local RSS leaders,” the source said, referring to the Hindu extremist Rashtriya Swayamsevak Sangh. Jeyalakshmi was unavailable for comment. Another pastor in Kanyakumari District reported that police tried to arrest him the third week of October on baseless charges. On Oct. 21, he added, police warned a local pastor leading worship in a house church that he must stop all Christian activities within 10 days, or else he would be arrested. “It is very disturbing that police are misusing their power,” Pastor Zeba said. There is a high level of police complicity in Tamil Nadu, Pastor Nehemiah Christie, director of legislations and regulations of the Synod of Pentecostal Churches and Alliance Defending Freedom (ADF)-India’s Tamil Nadu state coordinator, told Morning Star News. “The police are not worried at all to protect the fundamental rights and ensure the safety of citizens, instead they are openly going after Christians, disrupting their private prayers. It is all happening under the supervision of RSS and BJP supporters in the local government,” he said. ADF-India is actively engaging with the local Christians and Christian leaders in Tamil Nadu state to raise awareness, help them know what to do when their basic rights are denied and ensure that doors for the gospel are open, Christie said. ADF, which undertakes legal advocacy for religious freedom, notes in its campaign celebrating the 70th anniversary of the U.N. Universal Declaration of Human Rights that it is sadly ironic that Christians are persecuted in India, a country with a long tradition and legal framework of freedom of religion. In Chennai, capital of Tamil Nadu, police on Oct. 7 disrupted a Sunday worship service alleging that they received complaints against the congregation. Police summoned Pastor Immanuel and the complainant, Uma Mageshwari, to the Koyambedu police station two days later, on Oct. 9. Koyambedu police ordered Mageshwari and her aides to remove the flag immediately, but they protested. They removed it only after police threatened to file charges against them, the pastor said. “We are trying hard to complete the construction so that at least we can gather inside the building, and not in an open shack,” Pastor Immanuel said. In the Sarvanampatty area of Coimbatore District, Christians at Flock of Jesus Prayer Centre were praying when a police officer entered the building and told them that the police commissioner had sent him to investigate. Pastor Kalai Selvan said that on Oct. 2, his church arranged a special meeting to which friends and relatives were invited, and at least 350 people joined his congregation of 30 to 40 members to celebrate the one­-year anniversary of the prayer center. A policeman identified only as Marimuthu entered the church at about 4 p.m., he said. Another officer identified only as Ranganathan arrived at the worship site four days later, Oct. 6, saying he had been sent to investigate a complaint that the church was causing noise pollution and disturbing neighbors, Pastor Selvan said. Pastor Selvan and his wife went to the police station, and the inspector told him to come back the next day with documents showing permission to worship at the site. “I went to the collector’s office to seek permission, but the officials told me that they only give permission for public or common places of worship, and private places of worship like our prayer center do not need any permission to function,” Pastor Selvan said. After seeking advice from legal advocacy group ADF-India, he returned to the police station on Oct. 8 with the lease agreement and a Madras High Court order clearly stating that private places of worship do not need permission from district authorities. “I submitted the documents in the police station, and the inspector told me that the higher officials from the commissioner’s office had put pressure on him to conduct enquiry,” Pastor Selvan said. In neighboring Puducherry (also known as Pondicherry), a former French colony settlement, a mob of Hindu extremists attacked Christians assembled for worship at a home the morning of Sept. 30. A mob of Hindu Munnani members broke into Pastor Vincent Paul’s home at about 10:45 a.m. and began beating his family and the few friends who had joined them, he said. 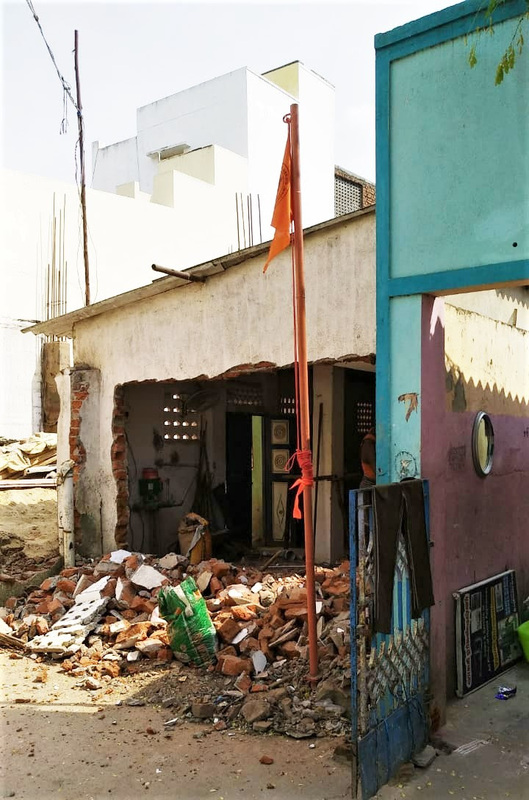 The assailants were identified as family members and close aides of Hindu Munnani leader Sanil Kumar, who lives just three houses away from Pastor Paul’s house. When he went to the Orleanpet police station to report the attack, the inspector initially told him that Kumar was not in town and refused to take his complaint. “Later, he warned me not to mess with Kumar and let it go,” Pastor Paul told Morning Star News. The pastor received a phone call from Kumar at noon. The pastor told Kumar he would agree not to report the attack on the condition that the Hindus would not disturb any more worship services. Kumar told him that he was the Hindu Munnani leader of the area, and that as long as it was under their control they would not allow any Christian activity, Pastor Paul said. Without freedom to worship in their own home, the family receives visits from other persecuted pastors who seek to offer them consolation, he said. “It is depressing to see Puducherry become unsafe for Christians,” Pastor Paul said.